Reveal your skin’s youth with Nuxe Nuxellence, a skincare range for complexions that need a revived boost of anti-aging care. 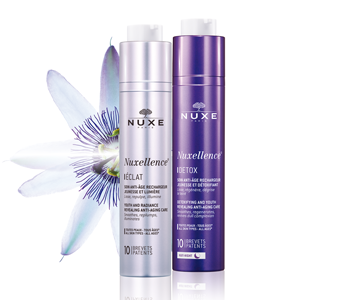 Any age and any skin type can benefit from using the Nuxellence range. This regenerative range helps to restore your skin cell’s optimum energy levels to reveal a brighter, more radiant complexion during both the day and night. Powered by plant energisers and 10 innovative skincare patents, passion flower, hyaluronic acid and silk tree work to rejuvenate your complexion to reveal a luminous, healthy glow to skin.